See the eagle in the tree? October was very quite business wise. A few late last minute guests to enjoy some very good fall weather. I think we had snow on the ground by now this time last year and it stayed until the following May. 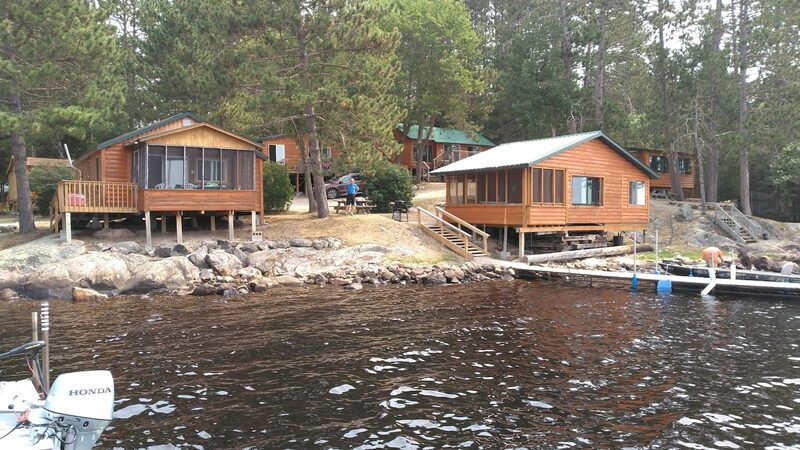 We have been very busy putting cabins to bed, raking leaves and finishing the garage project. Yes, the garage is done. Now just need to fill it up and get organized. We have started a renovation on #5 and will start #6 if the weather holds out. They both will be ready for the fishing opener 2015. Nothing real new on the family front. Everyone is doing fine. No deer hunting in Minnesota for me this year. The deer herd took a big hit the last two winters and most of northern Minnesota is buck only. I may travel with Chad and John to Illinois to watch them bow hunt. That will also give me a chance to see some family and a few friends. We are now taking reservations for the 2015 season. Book before 12/31/14 and lock in the 2014 rate. Make sure to call soon to guarantee the cabin and week/weeks or days you prefer. Please check the web sitewww.whiteironbeach.com for all the current up to date info and specials. We did not have a lot of fishing going on this past month. The exception was the awesome Northern that Dave Johnson caught the middle of October. They were trolling some crank baits and he landed the pictured 46 inch Northern. By the chart it weighted an estimated 28 pounds. That is the largest northern we have seen caught in a very long time. Best of all it was released and swam away for someone else to catch next season. Ice will be on soon and those crazy early ice walleye fishermen and women will be out there. Not me, I’ll wait for a foot or so of ice before I trek out to far. The ice fishing season was somewhat curtailed last season because of heavy snow, slush and very cold temps. Everyone is hoping for more tolerable weather for more days on the ice. The limited Permit lottery will be open for applications on December 16th, 2014 through close of business January 13th, 2015. The lottery will actually be run on January 15th and results will be released by January 21. The Go-Live Date for all entry points will be January 28, 2015.